A double rainbow spans the Kaministiquia River during a spring flood. 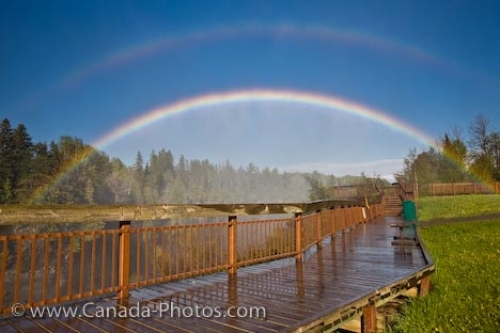 A view from the wet boardwalk of the Kakabeka Falls shows the misty double rainbow. Beautiful colors of the rainbow show just above the mists. The Kakabeka Falls is the largest falls of Lake Superior. Double Rainbow in the mist above the boardwalk at Kakabeka Falls (aka Niagara of the North) along the Kaministiquia River during a spring flood, Kakabeka Falls Provincial Park near Thunder Bay, Ontario, Canada.